It's time for another giveaway here at The Beauty of Life ... and this is one is quite exciting, if I do say so myself! 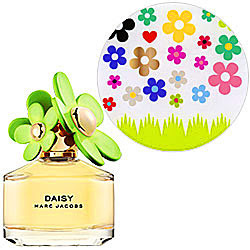 I've told you before how much I love Marc Jacobs Daisy (click here for a recap). Well, a limited-edition bottle came out this spring that I just have to share with one lucky reader! It's so spring-appropriate with its green daisies and customizable stickers. And one of you now has the chance to win this bottle! Notes of strawberry, violet leaves, ruby red grapefruit, gardenia, violet petals, jasmine petals, musk, vanilla and white woods make for a truly enchanting fragrance. Since this version is limited-edition, the value is a bit higher at $57. Entering is easy. Simply enter your name and email address in the box below. The winner will be selected on Friday, June 12 and notified by email. It's that simple! This giveaway is open to US residents only. Giveaway runs until Thursday, June 11 at midnight. One entry per person, email address and IP address. Multiple entries will be disqualified. Wow, great prize, thanks for the chance.